2011 is a year for the climatologist’s record books: record amounts of snow, rain, and heat; an earthquake, a hurricane followed by a tropical storm, and a paralyzing late October Nor’easter. November and December were mercifully mild. Water was almost entirely unfrozen for the local Christmas Counts, a rarity in recent decades. Through all of this 229 species were recorded in Somerset County in 2011 (eBird lists 228 but one extra record, Common Redpoll, is not in their database). Snow cover and cold temperatures hampered birding in Somerset throughout the brutal winter. The season was salvaged by a group of interesting gulls, Glaucous, Iceland and Lesser Black-backed as well as Herring and Great Black-backed, that stayed in Hillsborough into early March. Spring migration was mediocre. Shorebirds, storm birds, and geese were the stars in Somerset County this year. The wet summer weather created shorebird habitat throughout the county that is reflected in the number of shorebird species (17) and individuals. Hudsonian Godwit was a highlight as well as Stilt Sandpiper and widespread Pectoral Sandpipers. While most people in Morris and Somerset Counties were battling with fallen trees, flooding, power outages and road closures, Hurricane Irene on August 28 created a memorable experience for Jeff Ellerbusch at Finderne Wetlands where he had 4 Tern species (Least – probably a first for Somerset Co., Black – possibly another first, Common, and Forster’s) as well as 16 Laughing Gulls and an enormous number of Swallows before he moved to higher ground and out of the way of the raging Raritan River. Geese dominated the end of the year. In the first week of December five species were in the county: Greater White-fronted, Ross’s, Brant, Cackling and Canada. 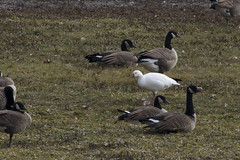 A Snow Goose in Far Hills on Dec 23 rounds out the month’s list. The Sandhill Cranes, five this year, returned again, as they have since November 2007, to forage in the corn stubble of Franklin Township first being located in November and sighted throughout December. As for the following report: single dates infer an only and/or first sighting; numbers of individuals infers a high count for the year. Dates are in the standard UK format of Date followed by the abbreviated month, e.g. 1 Jan for January 1st. Observers are listed at the end of the report, their initials used for the body of the report. Greater White-fronted Goose – 27 Nov through Dec, Duke Island Park, (MN, m.obs.). A goose found at Duke Farms on 12 Dec could be the same bird (MP). A second Greater White-fronted Goose was found on Schoolhouse Rd. on 1 Dec (JE) and was seen occasionally through the end of the month (JJC). Snow Goose – high count of 450 on 18 Feb at Duke Farms (HD). Ross’s Goose – 5 Dec, Duke Island Park (RW, m.obs.). The goose was seen one day only. 225 Brant flew past the Chimney Rock Hawk Watch on 21 Oct (JE, SL); another 50 on 22 Oct (JE). An immature Brant was found on Schoolhouse Rd. on 1 Dec (JE). 16-17 Jan, Bernardsville Quarry (SL, JP). 2 Apr, 28 Dec, Finderne Wetlands (JE). 12 Oct, 7 at Opie Rd., Neshanic Station (FS). November-December at North Branch Park, Bridgewater (m.obs.) with a peak of 9 on 18 Nov (JE). 21 Oct through December, Duke Island Park (m.obs. ), peak of 8 on 18 Nov (JE). 2 on 1 & 5 Dec at Franklin Township, Schoolhouse Rd. (JE). Tundra Swan – the county’s only record, 1-11 Mar, Opie Rd., Neshanic Station (FS, m.obs.). Also seen near the Studdiford Bridge, Branchburg area on 11 Mar (FS). Wood Duck – 85 at Glenhurst Meadows, 5 Apr (JE). Blue-winged Teal – 15 at Finderne Wetlands, 11 Oct (JK). Northern Shoveler – only singletons were found sporadically. Northern Pintail – 14 in Hillsborough, 16 Mar (FS); only two records for Autumn. Green-winged Teal – 170 in Glenhurst Meadows, 16 Mar (JE). Redhead – one record for the year, Bernardsville Quarry, 2 Jan (JP). Ring-necked Duck – 270 at Duke Farms, 10 Mar (HD). Lesser Scaup – only 1 for the year from Bernardsville Quarry, 1-3 Jan (JP, JE). Black Scoter – 21 May at Bufflehead Rd. Ponds, Bridgewater (JE, GM). This is probably a first county record. Bufflehead – 5 in Bridgewater on 7 Mar (JE). Other reports in the eBird database are Raritan River records which are too vague regarding location to distinguish whether they are in Somerset or Middlesex County. Common Goldeneye – Single birds on 30 Jan at South Bound Brook (TE) and 29 Mar through 11 Apr at Finderne Wetlands (JE, et al). There is the same issue with this species as with Bufflehead (see Bufflehead above) regarding location on the Raritan River with some records in the eBird database. Hooded Merganser – 45 on 17 Feb at Bernardsville Quarry (JE). Common Merganser – 59 on 10 Mar at Ravine Lake (JE). Red-breasted Merganser – 31 Mar, Bridgewater (JK); 2 on 14 Apr in Hillsborough (JE, FS) are the only reports. Ruddy Duck – 4 in Bridgewater on 18 Oct (JE) represents the high count. Northern Bobwhite – 14 Jun at Griggstown (FS). Wild Turkey – 35 in Hillsborough on 5 Jan (FS). Red-throated Loon – 2 reports from Chimney Rock: 2 on 22 Oct (JE, SL); 2 on 4 Nov (SL). Common Loon – 5 at Chimney Rock on 22 Oct (JE). Great Cormorant – The sole record is 12 Oct at Washington Valley Park (JE, JK). American Bittern – 2 at Lord Stirling Park on 26 Apr (JE). 1 of 3 reports for the year. Little Blue Heron – 15-21 May at Finderne Wetlands (JE, et al); 20 Aug-14 Sep in Hillsborough (FS, VS, JK). Black-crowned Night-Heron – Watchung Lake in June and August (JE); Raritan in August (JE, FS). Osprey – 128 on 30 Sep at Chimney Rock is probably an all-time high at this site and in the county. Swallow-tailed Kite – 21 April, Hillsborough (FS). Mississippi Kite – 7 Jun, Bridgewater (KT); 2 on 9 Jun, Basking Ridge (BB). Bald Eagle – 13 on 4 Sep, and 13 Sep at Chimney Rock. The Duke Farms Bald Eagles successfully fledged 2 male offspring. Northern Harrier – 13 on 17 Sep, Chimney Rock. Sharp-shinned Hawk – 447 (a Chimney Rock record) on 22 Oct, Chimney Rock. Cooper’s Hawk – 29 on 22 Oct, Chimney Rock. Red-shouldered Hawk – 27 on 30 Oct, Chimney Rock. Broad-winged Hawk – 4,421 on 17 Sep, Chimney Rock. Red-tailed Hawk – 19 on 28 Oct, Chimney Rock. Golden Eagle – 2 on 15 Oct; singles on 25 Oct, 6, 10, 13 Nov, Chimney Rock. – 28 Jan, Fairview Farm (JE, MW). – 7 Feb, Hillsborough (FS). American Kestrel – 50 on 25 Sep, Chimney Rock. Merlin – 13 on 22 Oct, Chimney Rock. Peregrine Falcon – 14 on 30 Oct, Chimney Rock. King Rail – 1 May at Lord Stirling Park (JE, SL). Virginia Rail – 3 Apr, Lord Stirling Park (HT); 2 on 29 Apr at Lord Stirling Park (JE). Sora – 2 at Lord Stirling Park on 1 May (JE). American Coot – 8 at Duke Farms, 2 Nov (HD). Sandhill Crane – single Crane 4 Jun, Glenhurst Meadows (JE); Cranes returned to Franklin Township, 3 Dec (AO). Total of 5 seen through December (m.obs.). The Cranes have been returning to this area since November 2007. Black-bellied Plover – 3 Oct, Lincoln Ave. Park, Manville (JE, JK, SL); again on 4 Oct (JE) when the same bird moved to Weston Cross Way. American Golden-Plover – 9 at Weston Cross Way, 28 Sep (JE). Semipalmated Plover – 5 on 15 May, Opie Rd, Neshanic (JE, SL). Killdeer – 122 on 30 Sep, Weston Cross Way (JE). Solitary Sandpiper – 18 at Opie Rd., Neshanic, 2 May, 5 May (FS). Greater Yellowlegs – 15 at Opie Rd., Neshanic, 1 May (FS). 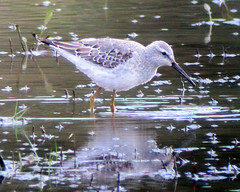 Lesser Yellowlegs – 19 at Opie Rd., Neshanic, 5 May (FS). Hudsonian Godwit – 22 Sep, Patriots Park (JE, JK) – probable first county record. Semipalmated Sandpiper – 15 at Patriots Park, 22 Sep, (JE). Least Sandpiper – 50 at Opie Rd., Neshanic, 12 May (JE). White-rumped Sandpiper – 8 at Patriots Park, 22 Sep (JE). 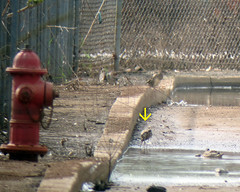 Pectoral Sandpiper – 18 at Lincoln Ave. Park, Manville, 1 Oct (JE). Dunlin – Only record: 26 May, Branchburg (JE) also seen 27 May (FS). Stilt Sandpiper – at Patriots Park: 22 Sep, (JE); 24 Sep (JG); at Lincoln Ave. Park, Manville on 3 & 4 Oct (JE, JK, SL). These are probably first records for the county. Wilson’s Snipe – 3 on 25 Feb, Glenhurst Meadows (JE); 35 at Glenhurst Meadows, 27 Mar (JE, JK, SL, JP). American Woodcock – 17 Feb, Franklin Township (ST). Laughing Gull – 16 at Finderne Wetlands, 28 Aug (JE). Ring-billed Gull – 700 at North Branch Park, 30 Nov (JE). Herring Gull – 442 at Six Mile Run, 2 Jan (SL). Iceland Gull – 2 in Hillsborough, 2 Jan (SL, JP) through 10 Mar (FS, m.obs.). Lesser Black-backed Gull – 21 at Opie Rd., Neshanic, 9 Mar (JK). Glaucous Gull – Hillsborough, 7-21 Feb (FS, m.obs.). Great Black-backed Gull – 9 at Six Mile Run, 2 Jan (SL). Least Tern – 28 Aug, Finderne Wetlands (JE); probably a county 1st record. Black Tern – 3 on 28 Aug, Finderne Wetlands (JE); possibly a county 1st record. Patriots Park, 28 Aug (JE). Common Tern – 12 on 28 Aug, Finderne Wetlands (JE); Bridgewater, 28 Aug (JE). Forster’s Tern – 28 Aug, Finderne Wetlands (JE). Yellow-billed Cuckoo – 1 May, Hutcheson Memorial Forest (JA). Black-billed Cuckoo – 8 May, Glenhurst Meadows (MN). Short-eared Owl – 7 Oct, Scherman Hoffman, Bernardsville, the sanctuary’s first record (MA, et al). Common Nighthawk – 3 May, Lord Stirling Park (JE). High count of 56 on 9 Sep, Chimney Rock (JE). Chimney Swift – 14 Apr, Bridgewater (JE). Ruby-throated Hummingbird – 24 Apr, Little Brook, Bernardsville (JP). Red-headed Woodpecker – Present at Glenhurst Meadows throughout 2011 with a high count of 6 on 13 Feb (JE). April and May, Lord Stirling Park (TC, MN). 17 Sep, Chimney Rock (SL). 21 Nov-13 Dec, North Branch Park (JE). 29 Dec, Colonial Park (JJC). Olive-sided Flycatcher – 22 May, Fairview Farm (KE). Eastern Wood-pewee – 1 May, D&R Canal South Bound Brook (TE). Alder Flycatcher – 11 May, Glenhurst Meadows (JP). WillowFlycatcher – 3 May, Lord Stirling Park (JE). Least Flycatcher – 2 May, Lord Stirling Park (MW). Eastern Phoebe – 11 Mar, Hillsborough (FS). Great Crested Flycatcher – 20 Apr, Six Mile Run (MA). Eastern Kingbird – 24 Apr, Scherman-Hoffman (MA). White-eyed Vireo – 1 May, Hutcheson Memorial Forest (JA). Yellow-throated Vireo – 28 Apr, Lord Stirling Park (JP). Blue-headed Vireo – 20 Apr, Six Mile Run (MA). Warbling Vireo – 24 Apr, Basking Ridge (JE). PhiladelphiaVireo, 10 Sep, Chimney Rock (SL). Red-eyed Vireo – 29 Apr, Lord Stirling Park (SL). American Crow – 750 at Glenhurst Meadows on 17 Feb (JE). Fish Crow – 15 Nov, 200 calling while flying south over Hillsborough High School (JK). Common Raven – widespread with a high count of 4 at Chimney Rock, 14 Sep (JE). Horned Lark – high count of 68 in Hillsborough, 9 Jan (FS). Northern Rough-winged Swallow – 24 Mar, Duke Farms (HD). Purple Martin – 30 Apr, Duke Farms (HD). Tree Swallow – 15 Mar, Glenhurst Meadows (JE). Bank Swallow – 5 May,Opie Rd. Neshanic (FS). Barn Swallow – 31 Mar, Bridgewater (JK). Cliff Swallow – 25 Jun, nesting on bridge over Raritan River. Seen from D&R Canal, Franklin Township (JE). Red-breasted Nuthatch – lightly reported: Jan-Apr, Somerset(JJC); 16 Oct, Chimney Rock (SL); 17 Nov, Duke Farms (HD). House Wren – 20 Apr, Six Mile Run (MA). Winter Wren – 20 Apr, Six Mile Run (MA). Marsh Wren – 25 Apr, Glenhurst Meadows (JE). Blue-gray Gnatcatcher – 5 Apr, Glenhurst Meadows (JE). Veery – 28 Apr, Scherman-Hoffman (JP). Swainson’s Thrush – 30 Apr, Glenhurst Meadows (TS). Gray-cheeked Thrush was not reported. Gray Catbird – 21 Apr, Glenhurst Meadows (JE). Brown Thrasher – 5 Apr, Glenhurst Meadows (JE). American Pipit – high count of 104 on 21 Oct, Opie Rd. Neshanic (FS). Cedar Waxwing – high count of 80 on 22 Oct at Chimney Rock (JE). LaplandLongspur – the lone report was on 9 Jan in Hillsborough (FS). Snow Bunting – the lone report was of 15 on 22 Jan in Franklin Township (JE). Ovenbird, 24 Apr, Little Brook Sanctuary, Bernardsville (JP). Worm-eating Warbler, 24 Apr, Scherman-Hoffman (JE, JK). Louisiana Waterthrush, 5 Apr, Bernardsville (JP). Northern Waterthrush, 25 Apr, Glenhurst Meadows (JE). Blue-winged Warbler, 24 Apr, Little Brook Sanctuary (JP). Lawrence’s Warbler, 9 Jun, Hutcheson Memorial Forest (DLP). Golden-winged Warbler, 1 May, Lord Stirling Park (DD). Black-and-white Warbler, 17 Apr, Scherman-Hoffman (NF). Prothonotary Warbler, 28 Apr, Lord Stirling Park(JP). Nashville Warbler, 26 Apr, Glenhurst Meadows (JE). Kentucky Warbler, 7 May, Lord Stirling Park. Common Yellowthroat, 22 Apr, Glenhurst Meadows (MN). Hooded Warbler, 14 May, Scherman-Hoffman (JE). American Redstart, 30 Apr,Lord Stirling Park (TS). Northern Parula, 18 Apr, Glenhurst Meadows (JE). Magnolia Warbler, 1 May, Hutcheson Memorial Forest (JA). Bay-breasted Warbler, 29 Apr, Lord Stirling Park (JE). Blackburnian Warbler, 30 Apr, Hillsborough Township (FS). Yellow Warbler. 20 Apr, Glenhurst Meadows (JE). Chestnut-sided Warbler, 14 May, Scherman-Hoffman (JE). Blackpoll Warbler, 6 May, Lord Stirling Park (RD). Black-throated Blue Warbler, 26 Apr, Warren Township (JE). Palm Warbler, 5 Apr, Glenhurst Meadows (JE). Pine Warbler, 20 Mar, Peapack-Gladstone (PB). Prairie Warbler, 24 Apr, Scherman-Hoffman (JK). Black-throated Green Warbler, 25 Apr, Glenhurst Meadows (JE). Canada Warbler, 8 May, Glenhurst Meadows (MN). Wilson’s Warbler, 10 May, Griggstown Grasslands (BS). Spring warbler misses: Cape May, Cerulean, Tennessee, Yellow-throated, Mourning, Yellow-breasted Chat. Connecticut Warbler – 16 Sep, Glenhurst Meadows (SL). Amazingly, this is the only report. Due to flooding at Glenhurst Meadows, a Connecticut Warbler hotspot? Tennessee Warbler, 16 Sep, Glenhurst Meadows (SL). Orange-crowned Warbler – from Glenhurst Meadows: 8 Oct (JE); 10 Oct (SL); 23 Oct (JE, JK, SL). These are the only reports. Vesper Sparrow – 18 Apr in Warren Township (JE); seen at Glenhurst Meadows from 15 Oct (RD) through 1 Nov with a high count of 3 (JE). Also, 3 at Finderne Wetlands, 24 Oct (MA). Savannah Sparrow – abundant at Finderne Wetlands in October, 175 on 10 Oct (JE). Lincoln’s Sparrow – only 1 in the spring – 5 May, Lord Stirling Park (MA); unusually sparse in the Autumn possibly due to Glenhurst Meadows’ (a typical Lincoln’s hotspot) flooded conditions. White-crowned Sparrow – 10 in Hillsborough, 24 Nov (JC). Blue Grosbeak – widely reported from Negri-Nepote Grasslands, Finderne Wetlands, Hillsborough, Grigstown Grasslands. Dickcissel – 2 at Duke Farms, June and July (NM); 3 during June 12-30 at Negri-Nepote Grasslands (m.obs.). Rusty Blackbird – 120 at Glenhurst Meadows, 27 Mar (JE, JK, SL). Common Grackle – 50,000 at Chimney Rock 30 Oct (JE). Purple Finch – hard to miss in the Autumn of 2010; hard to find in 2011 with a smattering of reports in April and even less in November. Common Redpoll – Glenhurst Meadows on 24 Feb (MH) is the only record for 2011. Pine Siskin – only a sparse number of winter reports. A high count of 5 in Bedminster, 12 Feb (JP). This document is copyrighted ©2012 by Jonathan Klizas and mocosocoBirds.com. Use without permission is prohibited.